List of Donors to: Jose’ For NH State Rep.
NEWS 3/2/2018: The campaign purchased 200 Color election brochures to be strategically distributed to all the small businesses in Canterbury and Loudon, and to confirmed voters that have pledged vote and support in getting others in town out to vote. NEWS 3/12/2018: Campaign establishes Non-Profit checking account with TD Bank to accept election donation checks. Made out to: JOSE’ FOR NH STATE REP. Diane Titus of Pittsfield, NH announced as Treasurer for the campaign. NEWS 3/16/2018: The campaign has just purchased ad space on the table mats at the Eggshell Restaurant in Loudon, NH. Campaign information will appear on 30,000 placemats starting in June for a period of 6 months. Everyone in Canterbury and Loudon eats at the Eggshell and they all read the placemats while they wait for their food. NEWS 3/24/2018: Jose’ Cambrils attends a candidate training session with Conservative support group NH 603 Alliance. It was an excellent and informative training session that every candidate should attend. Special thanks to Jim Kofalt, Diane Bitter, Fran Wendelboe, and the rest of the 603 Alliance for thier dedication and support of truely Conservative candidates. 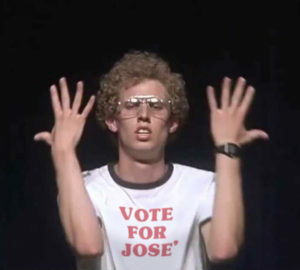 NEWS 4/5/2018: Campaign purchases 38 “VOTE FOR JOSE” T-Shirts, to be given out to “Top” Campaign donors and supporters. NEWS 4/13/2018: Campaign designs and purchases first 50 Election Yard Signs for the Primary on September 11. Yard signs are 24″ x 24″, Red and White, with “VOTE FOR JOSE'” slogan. NEWS 4/23/2018: Campaign sends “Press Releases” officialy announcing candidacy to the Concord Monitor and Union Leader news papers. NEWS 4/24/2018: Campaign puts out first Election Yard Sign at 83 Berry Road in Loudon. Candidate Jose’ Cambrils is accepted by the 603 Alliance – Initiative ’18 Project, for Conservative Republican Candidates. NEWS 5/3/2018: Candidate Cambrils starts 6-week training course GLA-1 (GrassRoots Leadership Academy) with the Americans For Prosperity organization in Manchester, NH. NEWS 5/19 & 5/20/2018: Candidate Cambrils Attends 2-Day training session with the 603 Alliance ’18 Project in Manchester, NH. NEWS 6/6/2018: Candidate Cambrils signs up for State Rep. ballot at Loudon Town Hall with $2.00 Fee. The race is now officially ON!!!! NEWS 6/7/2018: Jose’ Cambrils (Candidate for State Representative Loudon / Canterbury), completes 6-week course and receives GLA-1 certification (Grassroots Leadership Academy), from Americans For Prosperity organization. NEWS 6/8/2018: Candidate Cambrils election Ad appears on all Eggshell Restaurant place mats and will continue to be in place for next 6 months through election cycle. NEWS 6/9/2018: Campaign purchases an additional Ad space on the Eggshell restaurant place mats (15,000 copies). 2nd Ad will join the 1st in September and run for 3 months. The 2nd Ad is a miniture copy of the candidates election lawn signs. NEWS 6/14/2018: Candidate Cambrils is guest speaker at first meeting of the Canterbury Conservatives Coalition. Many thanks to Nick and Denise Fox for organizing this event and providing food and drinks. NEWS 6/28/2018: Candidate Cambrils signs and submits “Taxpayer Pledge” to the CNHT (Coalition of New Hampshire Taxpayers). Stating that I will oppose all efforts to impose a Sales, Income, or any other broad based taxes in NH. NEWS 7/11/2018: Candidate Cambrils receives endorsement and $100.00 in campaign funds from the Get Involved PAC. This is a Conservative and Strong Pro-Liberty grass roots organization. Special thanks to Mark Warden, Merav Yaakov, and Keith Carlsen for thier support. NEWS: 7/12/2018: Jose’ Cambrils attends a “Pro-Right To Work” conference sponsored by Americans For Prosperity. NEWS: 7/28/2018: Candidate Cambrils attends the “Beer Caucus” at the Hon. Howard Pearl’s Farm in Loudon. (50) Incumbents and new Candidate’s attended the event. NEWS: 8/4/2018: Jose’ E. Cambrils is featured as a State Rep. Candidate, with his Bio appearing on GRANITEGROK.COM. The is New Hampshire’s most popular Conservative Blog and News site. NEWS: 8/11/2018: Candidate Cambrils attends Loudon Old Home Day and mans booth with Senator John Reagan, Congressional candidate Steve Negron, Exec. Council candidate Jane Cormier, Representatives Mike Moffett, and Howard Pearl, and County Attorney candidate Paul Halvorson. NEWS 8/21/2018: Official Loudon and Canterbury voting ballots are issued with candidate Jose’ Cambrils for NH State Representative. Eggshell placemats with two candidate ads are now in restaurant for next 3 months. NEWS 9/6/2018: Candidate Cambrils is officially endorsed by the Conservative “Grass-Roots” organization, NH 603 Alliance. NEWS 9/11/2018: Candidate Cambrils receives 304 votes in Loudon and 106 votes in Canterbury for a total of 410 votes, and moves on to the General Election on November 6 as one of the two Republican candidates. NEWS 9/18/2018: Candidate Cambrils is endorsed by Merrimack County Republican Committee, and receives a $300.00 campaign donation. NEWS 9/22/2018: Candidate Cambrils celebrates Primary victory with other winning candidates at Concord Snow Shoe Club. Event was sponsored by the Beer Caucus and in attendance were NH Governor Chris Sununu, Congressional Candidates Steve Negron (CD-2), and Eddie Edwards (CD-1). NEWS 10/1/2018: Candidate Cambrils receives endorsement and an “AQ” rating from the National Rifle Association Political Victory Fund. NEWS 10/2/2018: Campaign purchases (40) more Lawn Signs for the final General Election. Two large 4′ x 4′ signs have been placed on Rt. 106 in Loudon, Thanks to Ken Kreis and Howard Pearl. NEWS 10/16/2018: Candidate Cambrils participates in debate vs. Democrat opponents at the Shaker Village Meeting Hall in Canterbury. NEWS 10/19/2018: Candidate Cambrils attends fund raiser for Congressional District 2 Republican winner Steve Negron at Loudon Country Club. Candidate Negron, who is currently a NH State Rep. gives Jose’ an endorsement for his election. NEWS 10/28/2018: Candidate Cambrils receives endorsement and an “A” rating from New Hampshire Firearms Coalition. NEWS 11/6/2018: Thanks to every one that voted for me. I received 1,127 votes in Loudon, and 442 votes in Canterbury. I beat Saunderson by 47 votes in Loudon, and only lost to 3 time incumbent Howard Moffett by 6 votes. I will be back in 2020 God willing. NEWS 12/10/2018: Attended the Veritas Awards ceremony for former NH Congressman Chuck Douglas at the Grappone Center.